Somewhere on the planet, at 11,660 feet….. The location for this one is a mystery. 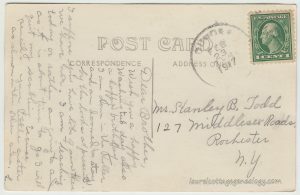 The writing on the back is “Mrs. Avildsen at [?] 11660 feet El.” Looks to me like that word there starts with a “C.” After some research, the best possibility found is that of Monte Cervino, aka the Matterhorn, so maybe from the Italian side of the mountain at 11,600 feet which is about 3,535 meters. That’s an ice field behind our smiling subject. Is she holding flowers? 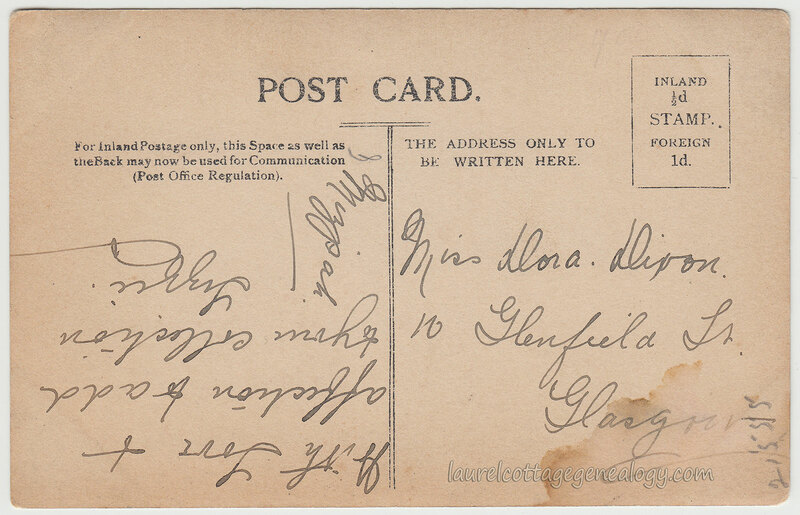 The postcard publisher or printer is another mystery. 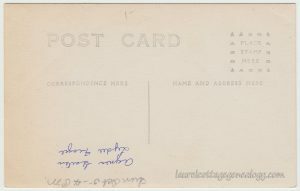 I’m not seeing this particular style of Real Photo Postcard back on any other site or in Walter Corson’s Publisher’s Trademarks Identified. Also, the size is a little smaller that the average RPPC (and the bottom doesn’t seem to have been cropped). 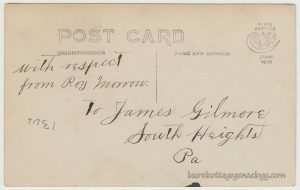 If the card was produced in the U.S. the postal regulations didn’t allow for the divided back until December 1907, though it could still be earlier if printed from another country. The smuggler/guide was saying he can’t afford to lose time. 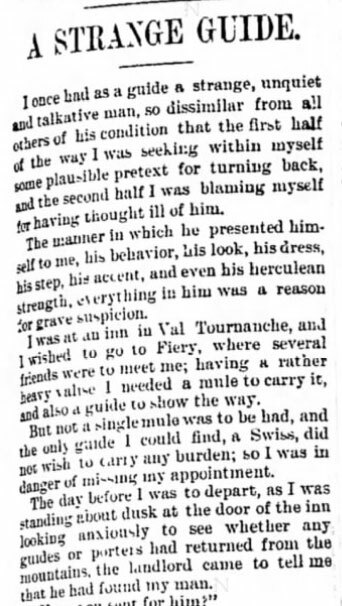 He asks the “guide-ee” for help searching for the missing relative, and it’s gladly given. I’m sorry to say that the story does not have a happy ending. The missing relative had stopped to rest in the heavy fog and “fallen asleep” in the cold never to awaken. The two searchers discovered that the man’s body had just been brought in that evening when they got back to the inn at Fiery. 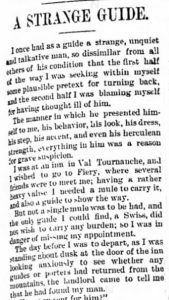 And we don’t usually put up the sad stuff here on LCG, but the article was touching – the way that the “guide-ee” changes his first negative impression of the guide, becoming, one would think, forever bonded with him through the shared experience of searching for that lost loved one. 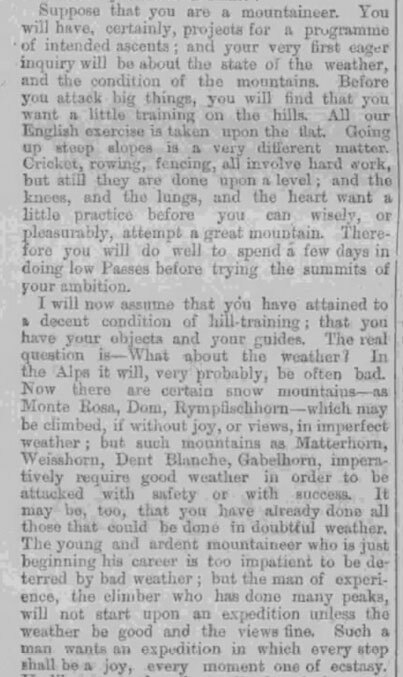 Below, from another beautifully written account, this one from 1880, three excerpts clipped from The Standard (London, England) entitled, “Gossip From The Alps (From A Climbing Correspondent. 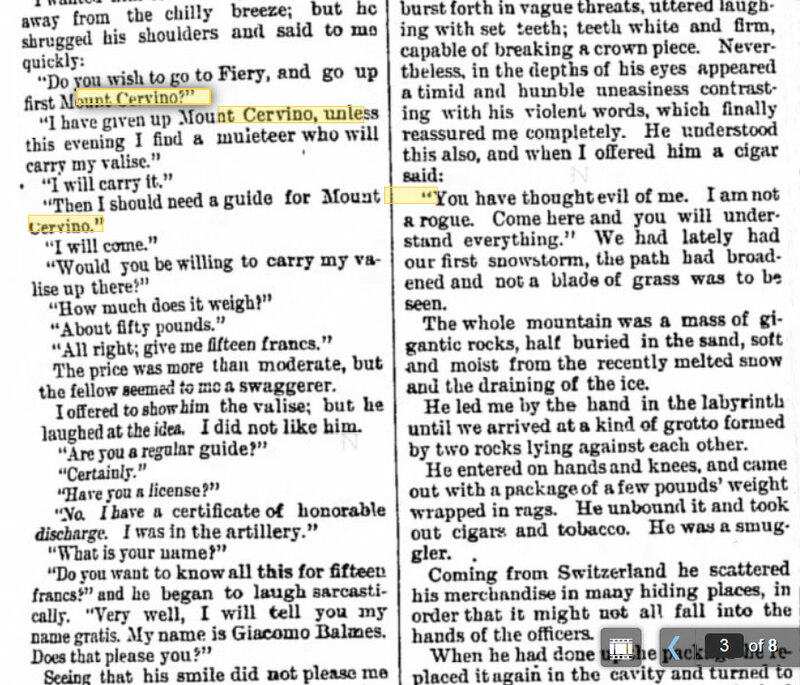 )” By coincidence, both articles are from newspapers called the Standard, one in Utah and the other London, UK. And, it always floors me, hitting upon a hitherto unknown subject, like for me the history of mountaineering, that very first glimpse into what would be an enormous vista of knowledge, that others have already been “living in”, so to speak, like in a living landscape of knowledge…..feels like coming to a party way late and getting a smidgen of a glimpse of everything you’ve been missing. And on the subject of women climbers! 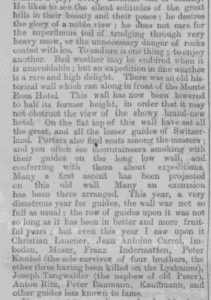 Well, that’s enough historical articles for now, as this post has really gotten long, though of course, the Alvidsen name was searched for but nothing came up in newspapers, so we’ll just include links to a couple of excellent web articles on the history of women in mountaineering, for some great photos and insight. 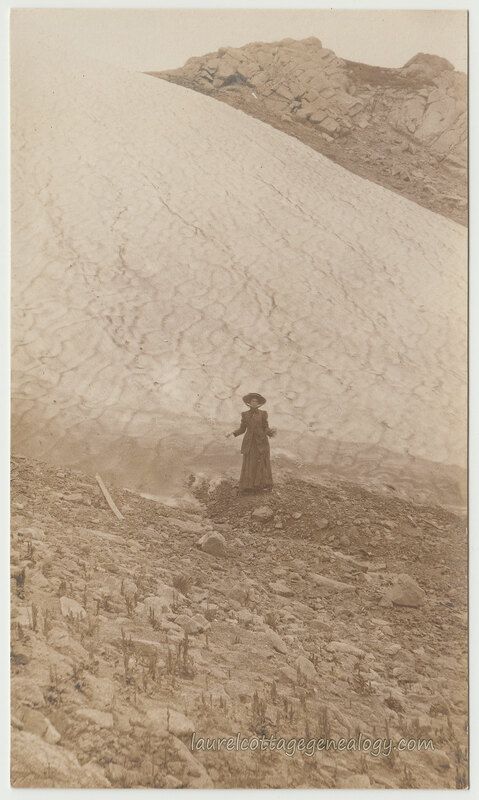 Just imagine climbing in a long skirt like the one Mrs. Alvildsen is wearing, and then that hat, at eleven and a half thousand feet, seemingly so incongruous from our 2019 vantage point. (Though a hat with a wide brim would have been a very good thing in the high altitude sun.) 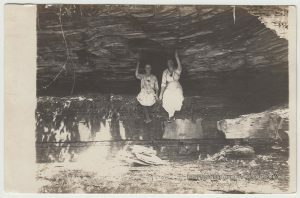 And how about the rest of what the early women climbers were up against, not just the clothing challenge, but in general, going against (or around) society’s code, to pursue their passion…..I especially love the part about Lucy Walker ditching her petticoat and stashing it behind a rock! Sources: Leadville, Colorado. n.d. https://en.m.wikipedia.org/wiki/Leadville,_Colorado (accessed April 7, 2019). Valtournenche. n.d. https://en.wikipedia.org/wiki/Valtournenche (accessed April 7, 2019). 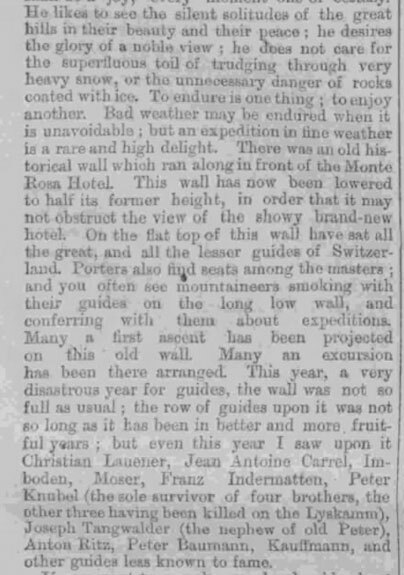 “A Strange Guide.” The Ogden Standard (Ogden, UT). 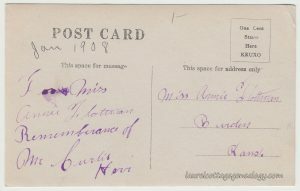 April 2, 1892. Saturday, p. 3. Translated by Antonio Meli from the Italian by G. Giacosa for Boston Transcript. (Newspapers.com). 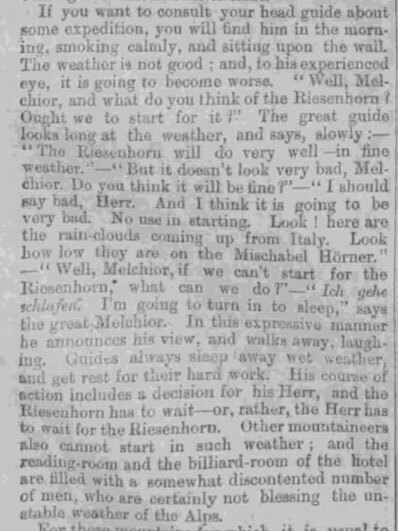 “Gossip From The Alps (From A Climbing Correspondent. )” The Standard (London, England). 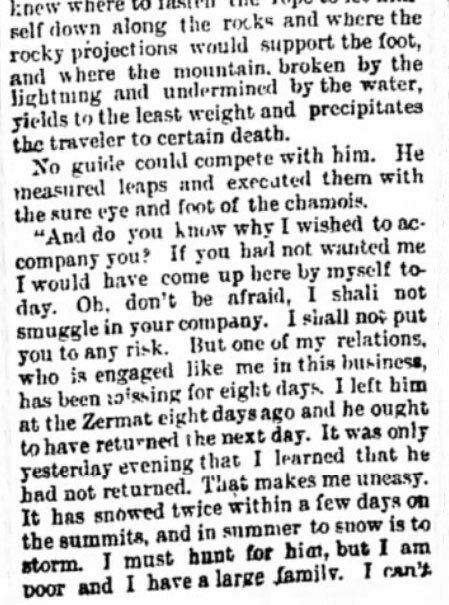 September 24, 1880. Friday, p. 2. (Newspapers.com). Siber, Kate. 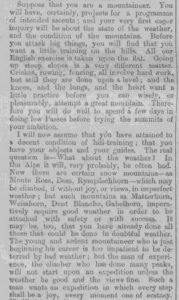 “One of the First Female Alpinists Was A Victorian Lady.” outsideonline.com. July 31, 2018. (accessed April 7, 2019). 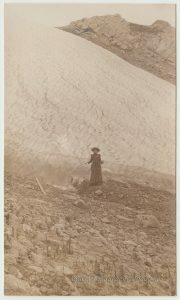 “For the Lady Mountaineer.” americanalpineclub.org. March 1, 2018. (accessed April 7, 2019). Photo, white border. Liverpool, England, 1945. 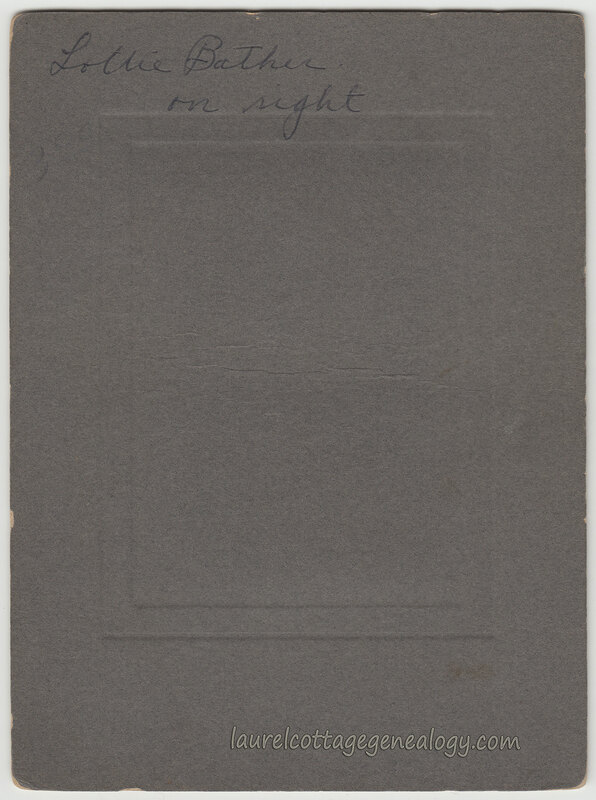 Velox (Kodak) photographic paper. Beauty in the wheat fields…. 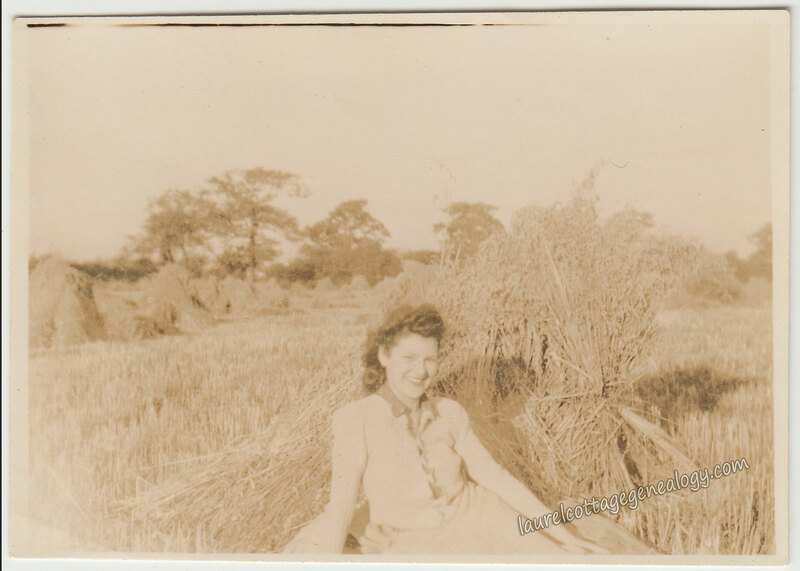 Aileen Johnston, a stunner with a beautiful smile, posing somewhere outside of Liverpool, England.This photo was taken in 1945, right at the end of WWII, maybe in August or September, according to the wheat harvest. It’s always so nice (unusual!) 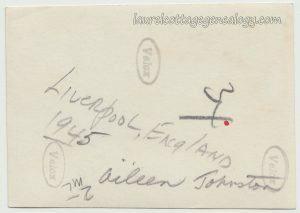 to have a name, date and a location on the back of an old snapshot. 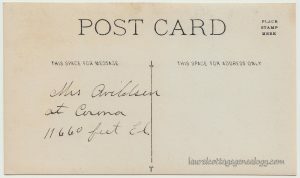 Divided back, Real Photo Postcard, circa 1907 – 1910s. CYKO stamp box. A nice family photo, we assume, of the Morrow Family, location unknown, maybe Pennsylvania or the neighboring Ohio. This wood structure home is in the Folk style called National, specifically known as an I-house, which was two rooms wide and one room deep. In this case a front porch was added on directly in the center. Note the detailing on the porch brackets. Also of note, the hand-hewn planks for the fence portion on our left. And, on the roof, there is what might be one long, horizontal snow break, unless maybe it was designed for footing, if someone was up on the roof making repairs. 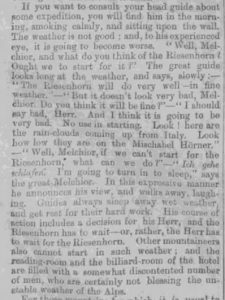 Source: McAlester, Virginia, and Lee McAlester. A Field Guide to American Houses. 1984. New York: Alfred A. Knopf, 1990. Print. 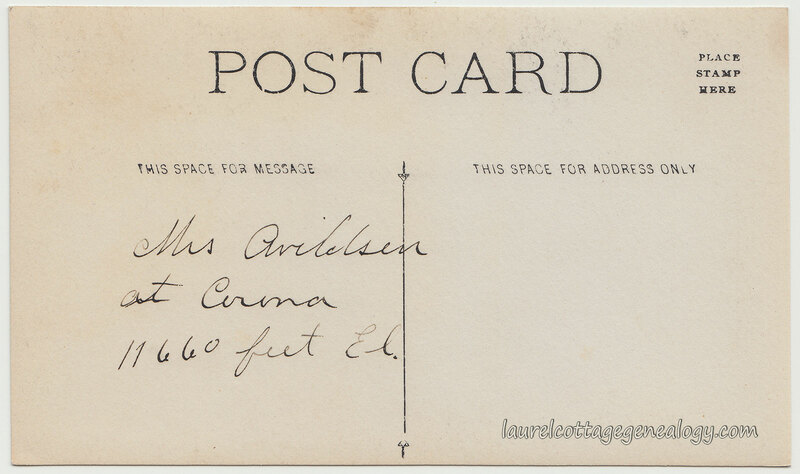 Divided back, unused, Real Photo Postcard. Circa 1902 – 1910. 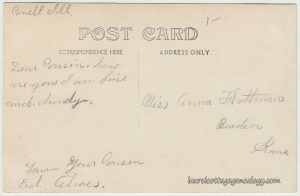 Which young lady in the postcard photo is which, is unknown, but Dora Dixon, was found on the 1901 Scotland Census, listed at the above address, born in England, about 1882, living with her parents, William and Margaret Dixon, and siblings Mary, Elizabeth, John, William, Henry and Robert. Dora in 1901 was age 19 and working as a waitress. 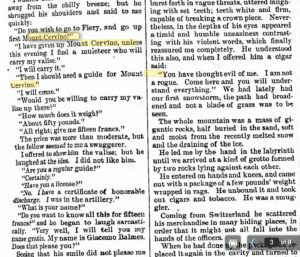 The given name Mizpah, sometimes spelled Mizpeh, is one we’d never hear before. The word means “watchtower” in Hebrew and denotes an emotional bond between two people who are apart. The ancient settlement of Mizpah is thought to have been in one of two locations, both just north of Jerusalem, though several other possibilities exist. There is also a Mizpah, Montana, New Jersey and Minnesota, as well as a whole category of jewelry which began in the early Victorian Era, and enjoyed a resurgence during WWI. See Michelle Graff’s article on the history of Mizpah jewelry. In the screen shot below you’ll see one or two pieces of Scottish origin, with the thistle, but many more can be found online. 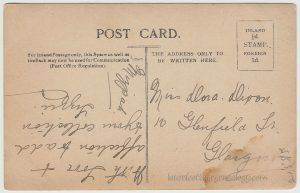 Sources: Parish: Glasgow St Mungo; ED: 64; Page: 20; Line: 4; Roll: CSSCT1901_276. (Ancestry.com). 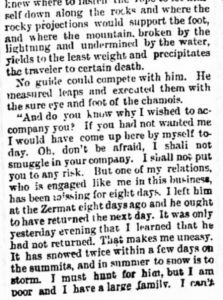 Mizpah in Benjamin. https://en.wikipedia.org/wiki/Mizpah_in_Benjamin. (accessed July 22, 2018). Graff, Michelle. 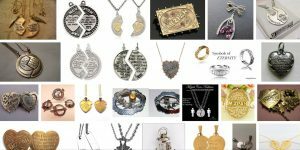 “The History Behind … Mizpah jewelry.” (https://www.nationaljeweler.com/independents/2059-the-history-behind-mizpah-jewelry). Accessed July 29, 2018. “images of mizpah jewelry” Google.com search, July 22, 2018. 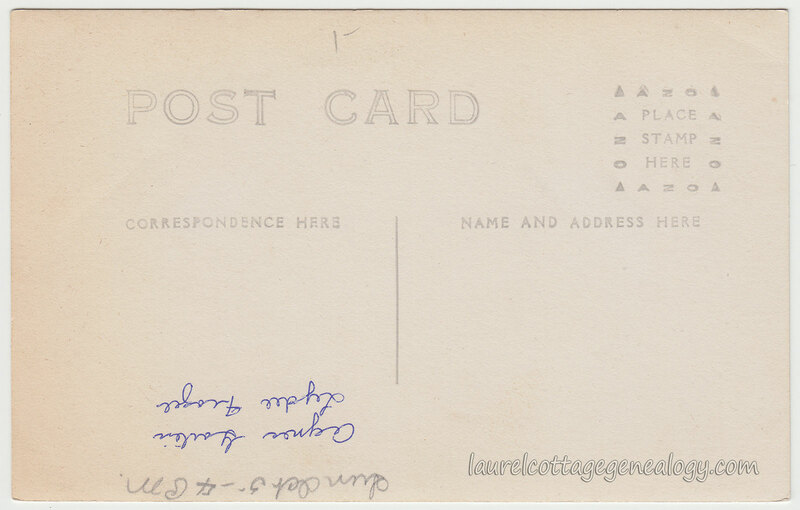 Divided back, Real Photo Postcard, postmarked February 23, 1917, Dundee, New York. Lucy was born in New York, about 1895. The 1920 Federal Census for Barrington, Yates County, NY, shows her occupation as teacher. 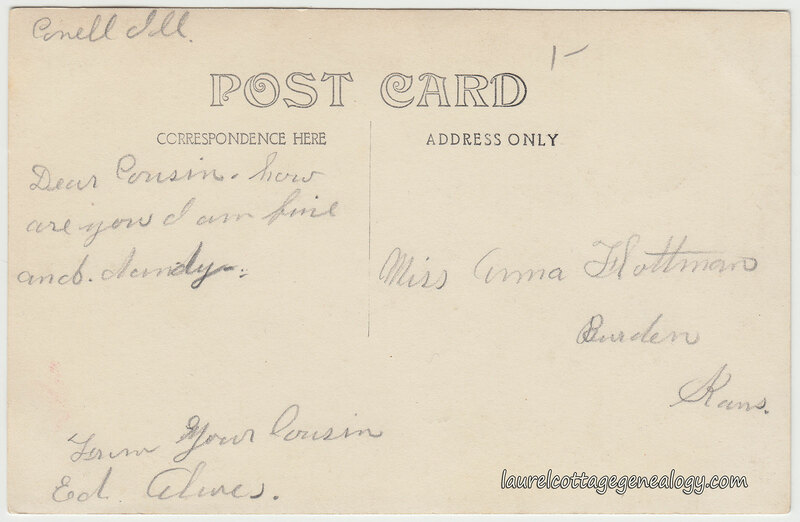 She’s staying with her parents, Charles H. and Lucinda A. 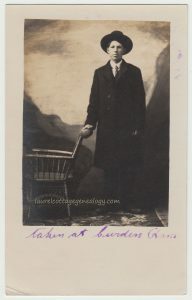 (Sheppard) Todd, along with Lucy’s brother, the recipient of the postcard, Stanley B. Todd. 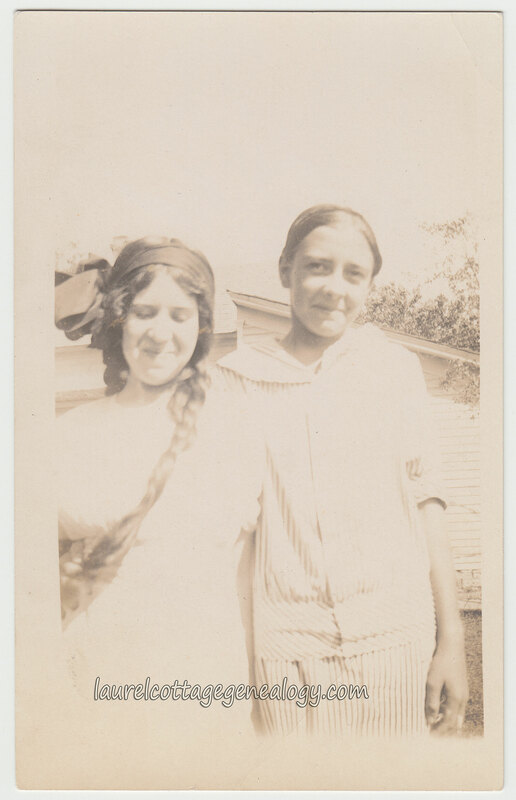 He’s about five years older than she; Stanley was born in New York, February 23, 1890. The girl in the photo, on our left, is unknown, maybe a student? 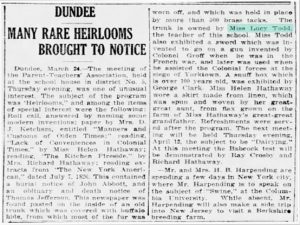 The location the card was sent from, had been a mystery, until finding the following newspaper article, mentioning Lucy Todd, a teacher in Dundee (Yates County, NY). Ahhhh, it’s Dundee! Lucy is mentioned below as the owner of an old trunk that was covered in buffalo hide which was held on by over 500 brass tacks…. 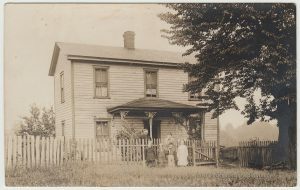 Sources: Year: 1920; Census Place: Barrington, Yates, New York; Roll: T625_1281; Page: 1B; Enumeration District: 189. (Ancestry.com). 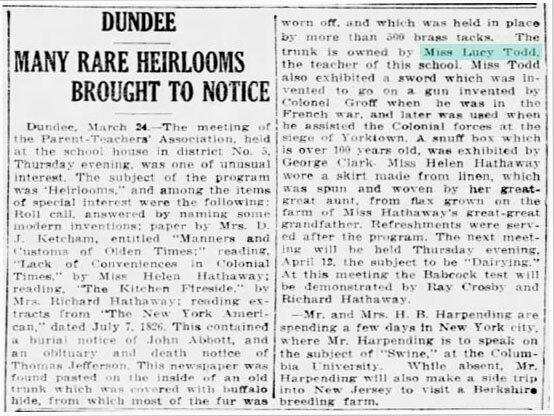 “Many Rare Heirlooms Brought To Notice.” Star-Gazette (Elmira, NY). March 24, 1917. Saturday, p. 14. (Newspapers.com). Find A Grave, database and images (https://www.findagrave.com : accessed 14 July 2018), memorial page for Stanley Benajah Todd (23 Feb 1890–6 Mar 1972), Find A Grave Memorial no. 121615568, citing Lakeview Cemetery, Penn Yan, Yates County, New York, USA ; Maintained by Kathleen Oster (contributor 47973435). Old photo, cardboard mounting. Photographer unknown. Circa 1890s. 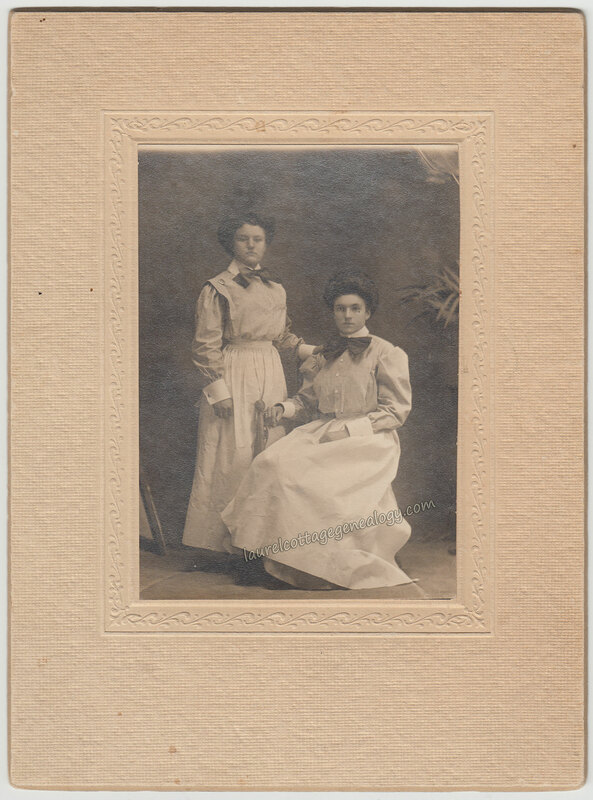 Lottie Bather (on our right) and friend or relative: The two ladies appear in uniforms; they are housemaids or perhaps nurses, and this photo was probably taken in the 1890s, note the wider sleeves (than the 1880 decade) and the Gibson Girl hairstyles. We searched census records for Lottie or Charlotte and even Lollie, as well as possible spelling variations for what appears to be Bather, but nothing definitive was found. But it’s a lovely photo, and you might have noticed the bottom right corner being raised just a tad. Yep, we looked underneath, ever so slightly, but no inkling of writing appears. Divided back, Real Photo Postcard, unused. Circa 1910 – 1918. This one’s a bit of a puzzle. I had sworn during research for the last post (in Burden KS via internet) that I’d come across the correct surname for this handsome gentleman. (A subcategory, that will hopefully be adhered to 😉 is being filed away somewhere “up top” entitled, “The Importance of Writing Things Down”.) His last name is hard to read in the signature. Alives, Alves, Aleves, Aluves, Alires were searched and how very odd now to be not finding the reference just previously come across. And the location he has written appears to be an abbreviation, possibly for Cornell, Illinois. 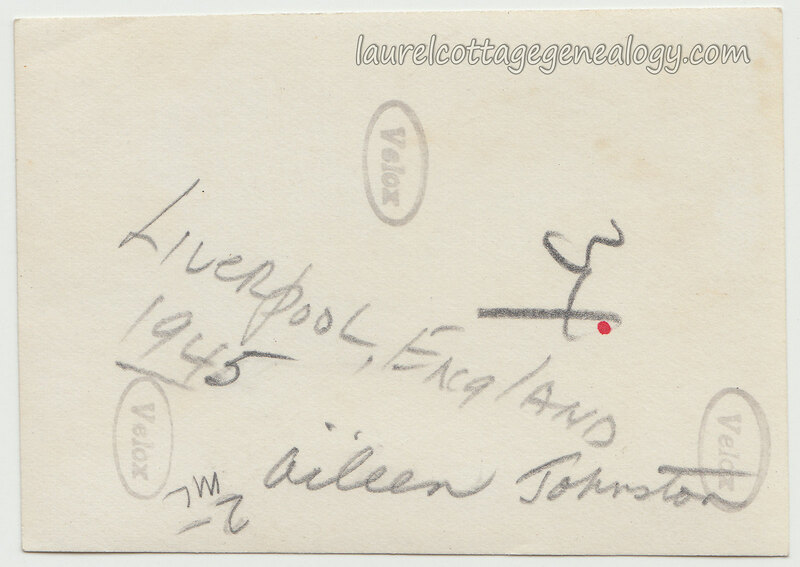 If Ancestry.com trees are correct for the marriage of Anna Flottman to Reason Leslie Moore on July 7, 1918, that narrows down the postcard time frame a little, since she was single when the card was sent to her. And for more about the recipient of this card, see the prior post. 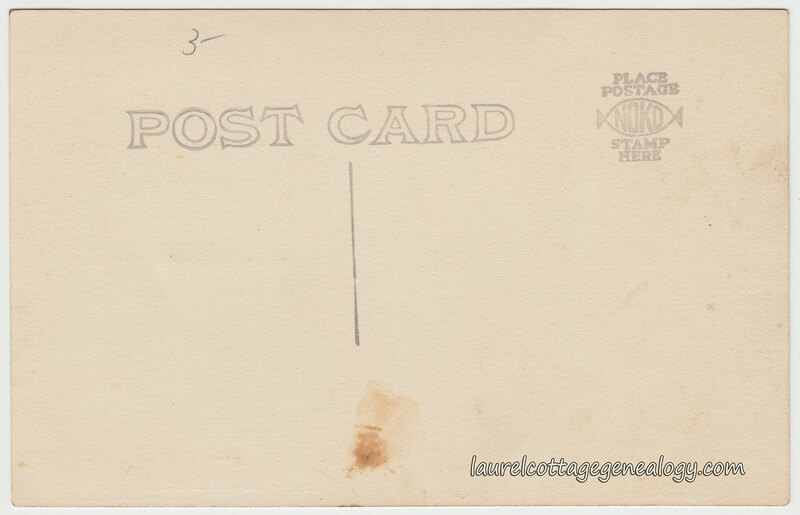 Divided back, unused, Real Photo Postcard. 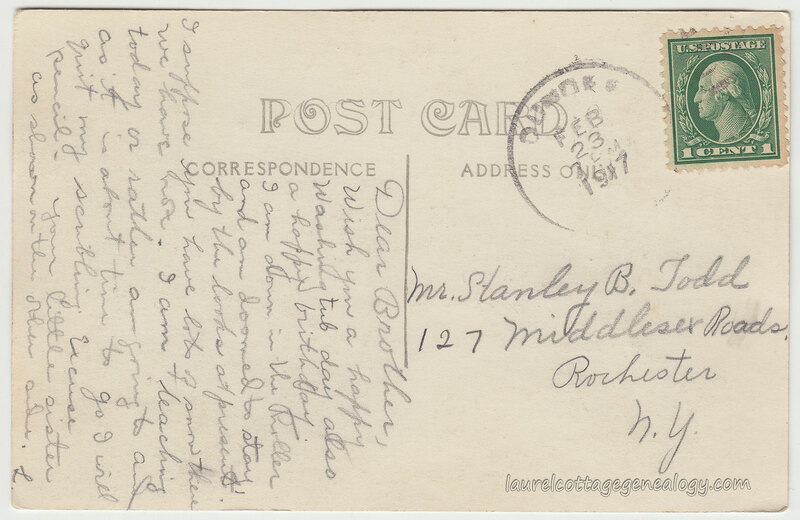 January 1908. KRUXO stamp box. Annie is Anna Louise Flottman, born in Kansas in 1883, daughter of Harman (also spelled Herman) Flottman and Mary Pickens. Annie’s brother Albert married into the Herr family. 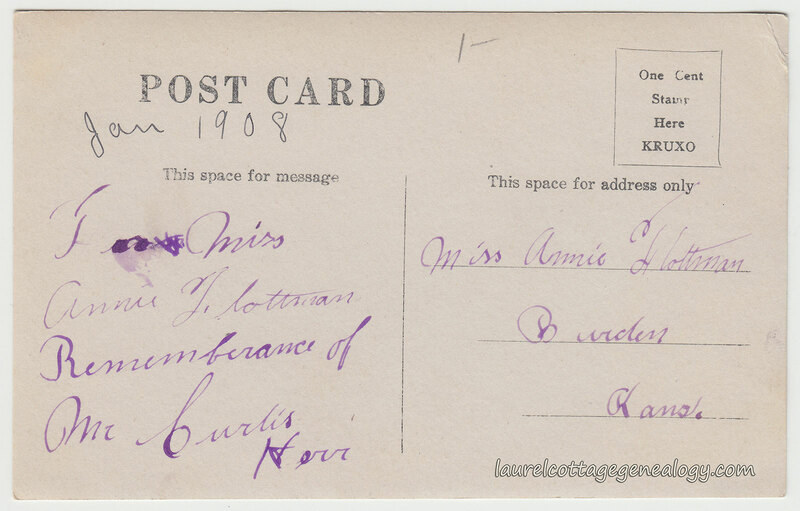 For another card addressed to Anna see the next post: Anna Flottman’s Cousin Ed. Sources: State Historical Society of Iowa; Des Moines, Iowa. Ancestry.com. Iowa, Delayed Birth Records, 1856-1940. Year: 1910; Census Place: Silver Creek, Cowley, Kansas; Roll: T624_436; Page: 1A; Enumeration District: 0062; FHL microfilm: 1374449. (Ancestry.com). Find A Grave, database and images (https://www.findagrave.com : accessed 21 June 2018), memorial page for Anna Louise Flottman Moore (13 Jun 1883–7 Apr 1945), Find A Grave Memorial no. 17647604, citing Grand Prairie Cemetery, Burden, Cowley County, Kansas, USA ; Maintained by Judy Mayfield (contributor 46636512). Find A Grave, database and images (https://www.findagrave.com : accessed 21 June 2018), memorial page for Matilda R. Herr Flottman (29 Apr 1885–21 Oct 1970), Find A Grave Memorial no. 17646745, citing Grand Prairie Cemetery, Burden, Cowley County, Kansas, USA ; Maintained by Judy Mayfield (contributor 46636512). 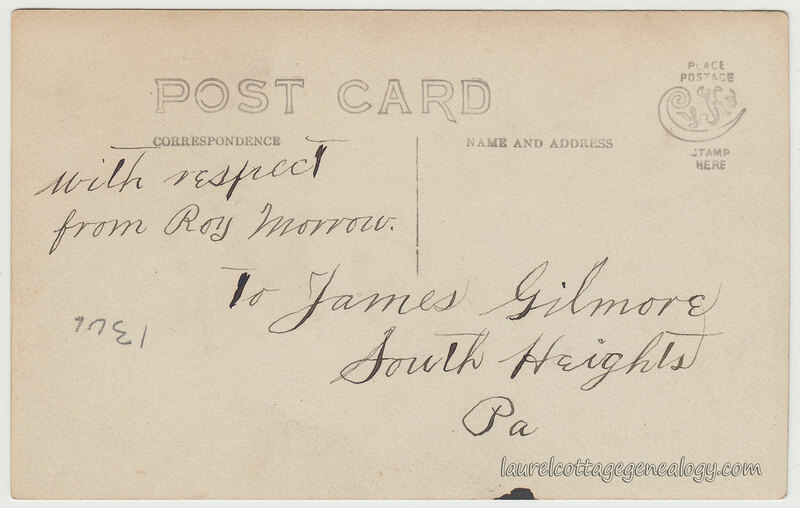 Divided back, unused, Real Photo Postcard. Circa 1915. AZO stamp box. 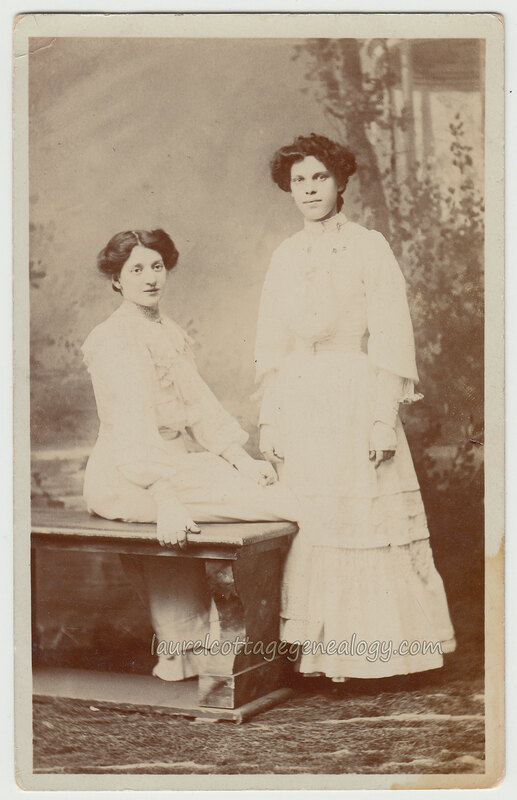 Two gorgeous girls: friends (or perhaps cousins) Agnes Gartin and Lydia Frazee, which is which we can’t say for sure. Per the writing on the back the photo was taken Sunday, October 5th at 4 p.m., year not given. From census records Agnes was born in Oklahoma about 1900, daughter of Mitch C. and Rosa D. Gartin. (Rosa’s maiden name is McMillan per Ancestry trees.) 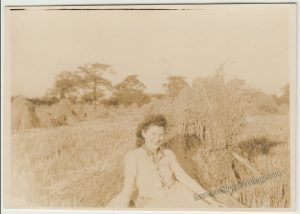 And Lydia “Lydee” was born in Kansas about 1901, daughter of Bert L. and Lena Frazee (Lena’s maiden name is Carter per Ancestry trees.) Most likely, the photo for this RPPC was taken in Morton, Sedgewick County, Kansas, around 1915 or so. 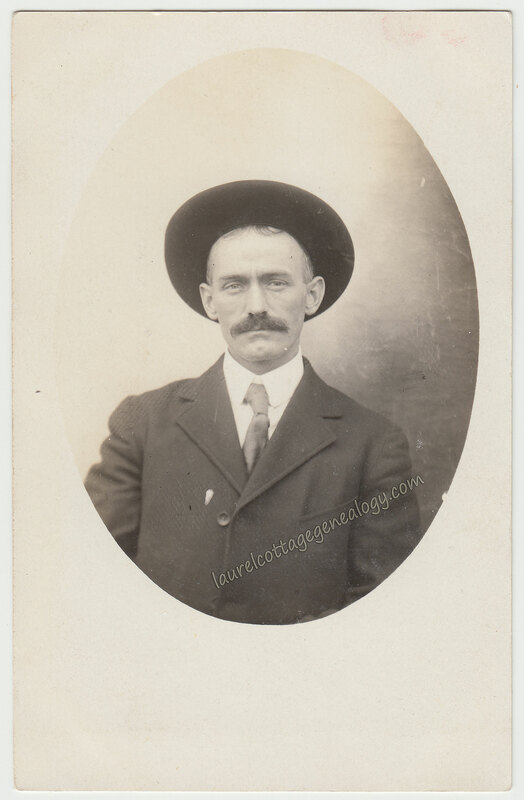 Sources: Year: 1900; Census Place: Patterson, Garfield, Oklahoma; Page: 5; Enumeration District: 0061. (Ancestry.com). Kansas State Historical Society; Topeka, Kansas; 1905 Kansas Territory Census; Roll: ks1905_147; Line: 28. (Ancestry.com). Year: 1910; Census Place: Morton, Sedgwick, Kansas; Roll: T624_455; Page: 10B; Enumeration District: 0090; FHL microfilm: 1374468. (Ancestry.com). Divided back, unused Real Photo Postcard. NOKO stamp box. Circa 1925. 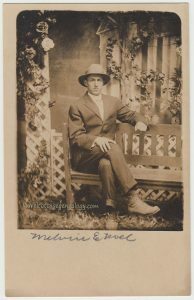 I think we can say beyond a reasonable doubt that this gentleman is Melvin Eustace Noel, born September 18, 1899 in Palermo, California, as no other possibilities were found. Melvin was the son of Daniel Noel and Daisy E. (Darby) Noel. We’re estimating maybe he was around 25 years old when the photo was taken. From records it appears he had never married and had made his living in the ranching industry. Makes sense as to his work boots and maybe best work pants that he wears for the photo, along with the suit jacket and tie. His WWII Draft Registration Card shows he was employed at that time by Amadee Ranch, address Wendel, CA with employer’s contact name and address given J. L. Humphrey of Reno, NV. 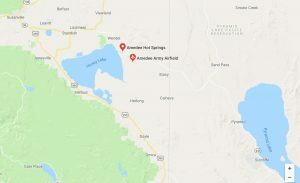 Below, a Google map showing the town of Wendel, just north of Honey Lake, and moving eastward, the California-Nevada border. 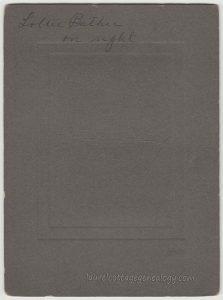 Sources: The National Archives in St. Louis, Missouri; St. Louis, Missouri; Record Group: Records of the Selective Service System, 147; Box: 1320. Ancestry.com. U.S. WWII Draft Cards Young Men, 1940-1947. Year: 1900; Census Place: Ophir, Butte, California; Page: 24; Enumeration District: 0020. (Ancestry.com). Original data: State of California. California Death Index, 1940-1997. Sacramento, CA, USA: State of California Department of Health Services, Center for Health Statistics. (Ancestry.com).